From our previous series on importing data from an Excel spreadsheet we learned of the importance in building the Operator Data Entry table. This table is a way to link columns in the spreadsheet to fields on the tag layout. The original blog post showed how to manually enter the table to match the spreadsheet, but in this article we show how this process can be simplified. For this method to work, your spreadsheet, like the one shown above, must have at least two rows of data. The first row must contain the column headings. Remember, our Operator Data Entry table must have entries that exactly match the columns in the spreadsheet to be able to link the spreadsheet to the layout fields. The other requirement is that the second row of the spreadsheet must contain sample data for each column. Our sample spreadsheet above meets these two requirements. Note that this sample spreadsheet also contains a column (column 'I') that's used to specify the tag count when printing. The count field doesn't actually need an entry in the Operator Data Entry table, but having it there doesn't hurt anything. You can always delete the COUNT entry after the import is completed if you wish. Along the upper right edge of this dialog we see the familiar Add, Delete, Insert and Clear buttons that we previously used to manually build the table. For this exercise notice just below these buttons is another labeled "Excel File". Before you enter anything into the table, click the Excel File button. This will open a file browser dialog that will allow you to navigate to and select your Excel spreadsheet. Select the spreadsheet and click Open and your table will immediately be populated with the data from your spreadsheet. Click Ok to save your new table. 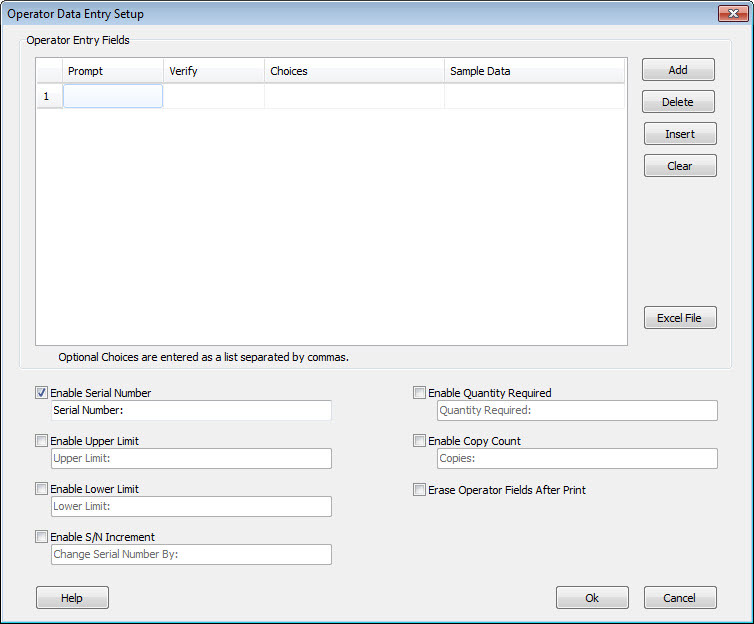 Using this simple technique you can quickly, easily and accurately build your Operator Data Entry table for your tag layout.